SnowGo, SnowGo Assist and Snow Angel nominations! The Snow Go program helps seniors and people with disabilities find a reputable and reliable individual or contractor to clear snow from their private driveway and walkway. The City of Ottawa partners with the Senior Citizens Council and local home support agencies to deliver this winter program. Eligible low income seniors and persons with disabilities can also apply for the Snow Go Assist Program and receive financial assistance for snow clearing. Approved participants may be reimbursed for 50 per cent of the cost of snow clearing, up to a seasonal maximum of $250. Low income is defined as an annual income of below $25,000 for a single individual and below $32,000 for a household (two or more persons). An Older Adult is considered any person over the age of 60 years. NEW: Do you know a Snow Angel who deserves recognition? A Snow Angel is a neighbour or friend that has volunteered to help you, or someone you know who is elderly or has a disability, to improve their accessibility during the winter by clearing snow or ice from their driveway, steps or walkway. If you know of a resident of Ottawa who is a Snow Angel, the City of Ottawa wants to thank them! Snow Angels will be recognized with a certificate signed by the Mayor and a custom keychain with a snowflake symbol and Ottawa logo. To nominate a resident for recognition as a Snow Angel, please send the City the name and address of the candidate, as well as relevant details (who they are helping and how), by contacting communitypride@ottawa.ca or calling 613-580-2424 x13363. For more information about these programs, please visit ottawa.ca/snowgo or call 3-1-1 (613-580-2400). Two weeks ago, this column focused on 2013 and now I’d like to take a few moments and look ahead to what we can expect in 2014. Much focus will be on how the western development lands, in Richmond, proceed with one of the developers already having appealed their application to the Ontario Municipal Board. The City, of course, rejected the application upon the appeal being filed. As this moves forward, I will be sure to provide as many updates as possible to keep everyone in Richmond and the surrounding area informed. The Ottawa on the Move program returns for its final year of infrastructure renewal. Residents can expect to see the resurfacing of Mansfield Road, between Conley Road and Munster Road. Resurfacing will also take place on First Line Road, Church Street, Rideau Valley Drive South, Walgreen Road, Willowlea Road and Westbrook Road. The latter three roads listed make up the Reed industrial park off of Carp Road, north of Rothbourne Road. 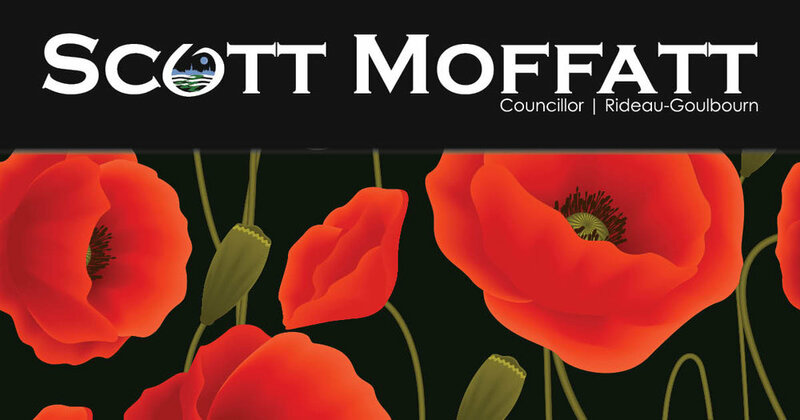 There will also be some intersections improvements at Moodie Drive and Fallowfield Road as well as installation of roundabouts at Flewellyn Road & Eagleson Road and Fernbank Road & Shea Road. From a city-wide perspective, 2014 will see the re-opening of the stadium at Lansdowne Park, to be known as TD Place. This will mark the return of CFL to Ottawa for the 2014 season and also announce the arrival of professional soccer to Ottawa in the form of a North American Soccer League franchise, the Ottawa Fury. Also, barring any further delays (unfortunately, I have to say that), the Strandherd/Armstrong Bridge will open this year as well. As the year goes forward, we’ll touch on many more events and issues that take place throughout 2014. If there is anything in particular that you’d like to see happen this year, please let me know. It’s that time of year again. It’s time to support our local community organizations and businesses at the West Ottawa Board of Trade People’s Choice Business Awards. Nominees include the Bell Warriors Football Club, Goulbourn Museum and the Richmond Legion in the Community Support/Non Profit Organization category. In the Tourism Business category, you can vote for the Canadian Golf & Country Club, Jabulani Vineyard & Winery, Richmond Fair or Saunders Farm. Spotlight Hair & Spa in nominated in the Health & Wellness Business category while Creekside Gardens has been nominated in the New Business category. Royals Restaurant was nominated for Best Restaurant and nominees in the Retail Business category include That Hunting & Fishing Store and King’s Your Independent Grocer. In the Large and Medium Business categories, local nominees include Cavanagh Construction and Amsted Design Build. Nominations close at midnight on February 3rd. Winners will be announced at a ceremony at the Brookstreet Hotel on February 20th. The great outdoors is the place to be this winter with the Rideau Valley Conservation Authority’s outstanding Winter Adventurers PA Day Camps. Children aged six to 12 are invited to spend a great, fun-filled day with Rideau Valley Conservation Authority (RVCA) interpreters and learn how to snowshoe, erect shelters, build campfires, cook outdoors and orienteer. Add a few great outdoor games to the mix and the day will be complete! RVCA is hosting a camp this Friday, January 17 at Baxter Conservation Area from 9 a.m. to 4 p.m. For more information or to register, contact Andrea Wood at 613-489-3592 or andrea.wood@rvca.ca. The camp is $40 per child ($35 for additional children in the same family) and includes snowshoe rental, snacks and the traditional reward of a frothy hot chocolate after a day of frosty fun. There is a maximum of 20 participants, so register early. This program is being offered as part of the RVCA’s Active • Outdoor • Life series. To learn about other Active • Outdoor • Life events, visit www.rvca.ca. This Friday, January 17th is a P.A. Day for most students and a great day to learn about the Olympics at Watson’s Mill’s Olympic Camp. This camp runs from 9:00am until 4:00pm in the Carriage Shed. Learn about winter Olympic sports and take part in Olympic themed crafts and games. This is the ultimate preparation for the upcoming Winter Olympics in Sochi, Russia. Cost is $25 per child ($20 for Watson’s Mill members). Call 613-692-MILL for more information and to register. Come join Ottawa farmers and chefs in a celebration of local food and culinary talent. Savour Ottawa is hosting its third annual Harvest Table at Brewer Park on Sunday, August 18, 2013. Guests will enjoy a multi-course gourmet luncheon highlighting the harvest and be able to sample from local wineries and craft breweries. For more information and a full list of participants please visit: the Savour Ottawa website. Tickets are on sale now! You can purchase tickets online here. Volunteers Needed! We are looking for volunteers to help with set-up, take down, and anything else required on the day of the event. This is a great opportunity to meet the city’s chefs and farmers and be included in one of Ottawa’s biggest foodie events of the year! All those interested should email Just Food for more information. The City of Ottawa is reaching out to residents this spring in order to improve how staff consults with individuals and groups on important issues. where you want to be reached. how you want to be consulted. There will be four bilingual community consultation sessions held between March 25 and April 16. For those who cannot attend a consultation session but still want to contribute, a survey and ideas campaign will be available on ottawa.ca between March 25 and April 19, 2013. All community consultation sessions run from 7 to 9 p.m.
To register for one of these sessions, go to ottawa.ca, call 3-1-1 or visit any Client Service Centre. For more information on public engagement at the City of Ottawa go to ottawa.ca. As many residents of Rideau-Goulbourn are aware, Scott is an active user of Twitter, which allows him to send out short updates about various topics no matter where he is. He faithfully shares the stories of his Councillor for Hire adventures, including tidbits of information he learns. This is always particularly interesting when he gets to work in City facilities. Scott's latest took him out to the Trail Road Waste Facility, which is one of two landfills within the borders of Rideau-Goulbourn Ward. We've put together the story here for anyone who missed seeing his tweets. There is a lot of Casino talk around Ottawa these days. Many of you may recall the debate in the 1990’s about whether or not the former City of Ottawa should put a casino on Sparks Street. At the same time, the City of Gloucester was moving one step ahead, permitting the installation of Slots at the Rideau Carleton Raceway. A few of the folks around back then are looking to revisit the debate and are again looking to have a casino downtown. The problem with that is that it would come at the expense of the Rideau Carleton Raceway and its 1,000 local jobs. The Species At Risk Farm Incentive Program (SARFIP) assists with on-farm practices that contribute to healthy and diverse wildlife habitat and is now available for 2012 projects. SARFIP is administered by your Ontario Soil and Crop Improvement Association (OSCIA) with funding from the Ontario Ministry of Natural Resources (OMNR) and the Government of Canada. Celebrate the Local Harvest with Savour Ottawa! Celebrate Ottawa's bountiful harvest and culinary talent with a five-course luncheon prepared by local chefs from fresh, seasonal ingredients provided by local farmers. Dine family-style with local farmers and chefs in a beautiful setting at the Ottawa Farmers' Market in Brewer Park. If you have taken both Primer I and Primer II, you are invited to register for this elective course. If you have not taken the Primer series, please do not register for this session. The concepts and information that are imparted in the core courses are integral to understanding the material presented in the elective courses. Ottawa Fire Services (OFS) is encouraging residents to donate their old or scrap vehicles to the Vehicle Donation Program. Your donation can help firefighters continuously practice their skills and rescue techniques, and you will receive a $500 tax receipt in return. Even if your vehicle does not run, it can still be used, and OFS will arrange to have it picked up for free. The Ottawa Drowning Prevention Coalition wants to remind residents that when the temperatures go down, awareness of the dangers of being on or around ice and open water needs to go up. When water begins to freeze on rivers, lakes, the Rideau Canal and other open bodies of water it may look solid but is often still dangerous.